Thank you for visiting to read about this very important subject to me. On June 8th and 9th I will be doing two things that I love dearly: riding a bike and raising money and awareness in the fight against cancer. It wasn’t too many years ago that I got the call. It was the call that my father didn’t want to make, and nobody wants to receive. It was a phone call from Toronto to Vancouver to tell me that my Mom had lost a long battle with cancer. Every turn of the pedals, every single time I ride is for a reason. It is to remind me how lucky I am, and how important it is to do everything I can to keep ahead of this disease. Cancer doesn’t discriminate. We don’t choose who wins and loses. We can only do our best in our own way and hope that it won’t choose us or the ones we love. Unfortunately, fundraising isn’t my strong point and for that reason I am coming to the you, my community, and reaching out for help. I am leading a team of riders from my company in the first year that our local office has put together a team. I’ve done so much to ensure that the team has the support that they need that but I am in need of your help to reach my personal goal or else I won’t be able to ride, and my goal to make my mark on this disease, even in this small way, may not be able to happen. I know that it is a challenge to make financial commitments, but I hope that you or your organization can help me to reach my modest goal and I will be sure that your efforts and commitment are appreciated and shared as I pedal 200 km in 2 days to show this disease that we won’t go down without a fight. This time of year is always a challenge. It is a time to celebrate, which we usually pair up with lots of dinners, treats, drinks with friends and so much visiting that the personal schedule is pretty much thrown out for the month, which also includes fitness time. As a cyclist, I usually have summer targets for peak fitness. And by peak fitness, I mean to be able to generally keep up with the cycling group that I ride with. I’ve been cycling semi-competitively for about 6 years now which has helped me to maintain a fairly healthy lifestyle. Challenges in life come along of course, and along with that can be unexpected changes in lifestyle. In the last year I had a number of changes in my lifestyle that resulted in a gentle decrease in fitness with a gentle increase in my intake. These two things combined together resulted in a 20 pound increase in my body weight. This year I participated in the Tough Mudder event in Toronto. Because I knew that I was increasing my strength, I was more focused on doing resistance training and relying on a reasonable aerobic base to get me through the race. My diet plan was simple…no plan. I just ate at a typical North American rate of around 2400-2700 calories a day. Diet and exercise are paired together…always. If you have one, or the other, but not both you will slip out of your overall fitness regardless of how much you increase the other. There is a term called “thinspiration” which is meant to be your thin-inspiration, or what it is that you see as your goal to reach a body image. I use a fitness goal as the only target, with the body image being the result rather than the desire. For me, there was a simple way to become “thinspired”. I saw a picture of myself at the event and realized that although I was physically stronger because of my workout routines, that I was definitely carrying some extra weight. This was my kickstart moment to get aggressive about my health and fitness again. On the heels of a great training year, I have now reduced my intake and changed my diet to be much more balanced. That being said, I also still enjoy great food and some sweet treats, but with the goal to either counter that intake with exercise, or to reduce intake at other times to reach that balance overall. Within the 12 weeks following the event I had achieved my goal of levelling my weight back to my “race weight” goal and also to ensure that I continue to use aerobic base training and resistance training to increase my power to weight ratio and build on my core fitness to be over and above where I have ever been in the past. Part of my every day goal is now to add something called #plankaday to my routine which is to do a plank at least once a day, every day and make your goal to reach and increase your plank time each day. More than anything, the goal is to be consistent and to add that fitness regime to your daily tasks so that it becomes a priority, which is what your health and fitness should be! In a week I have been able to get my daily plank time up to 2:17 and I have set my goal to reach 3:00 by January 15th which is a reasonable and achievable goal, but more than anything it is a goal. The long and the short of my story is that I was able to make gentle changes to my lifestyle in order to have reachable goals, and more easily make the diet and exercise plan easy to achieve within my schedule. I’m a single dad with two kids, so I’ve learned to be creative with squeezing in workouts including using home routines as simple as push-ups, planking and crunches when I don’t have a chance to get to the gym. Not only has it helped me to feel better about my health, but it has inspired my kids to also make exercise a fun part of their day. There is not much better to inspire me than to know that my family will be inspired by ourselves. I’m sharing my story because I want to be able to do anything I can to help others see that there are successes possible without having to make massive commitments to time and crazy diet changes. It’s also important to see that every day lifestyles can easily make simple changes to get you to feeling better about things. I hope that you can find your thinspiration, and if anyone wants to learn any tips on how to make the same kind of gentle changes to their lifestyle to reach real, attainable goals, then feel free to add a comment, or Tweet me and I’d love to share in your journey to your own personal goals. Some time in the fall of last 2011 I was shown an event by a colleague at work. The email subject was something along the lines of “this is nuts…we should try it”. My response was similarly comical. “This is crazy. I’m game”. There are a few moments in your life that you will see something that is beyond what you imagine you can do. The adventure comes when you share that thought with someone. It’s not that I wish that I hadn’t said that I would join into the event. I suppose there is not much of a better way to commit to a massive personal and team physical challenge. The event is called Tough Mudder. For those who aren’t familiar, here is a little video which shows you what it’s all about. Scared? I am. But any trepidation that I have about it is removed by the excitement of the challenge ahead, and the beginnings of a really great team of people to go through the experience with. I will be updating along the way as we get closer to the event. Most importantly I will be working with a charitable organization to fund raise throughout training, up to and during the event. It’s my firm belief that I am lucky to be able to participate in such an exciting event, so I would like do whatever I can to inspire others, and to raise awareness about physical activity and its benefit to everyone. Because my primary sport is cycling this is a big departure from anything I have ever done. I am going to work as hard as possible so that I can step up to the task and help my team members as we tough it out through this gruelling, yet exciting event. It’s going to be an adventure! It’s spring time and with summer fast approaching many people are getting into the weight loss state of mind. A typical situation at the beginning of each year is that a number of people who are nicknamed “The Resolutioners” will become aggressive with trying to lose weight based on a New Year’s resolution. If you were to open the financials up for any local gym in your neighbourhood you would probably see a massive increase in membership and attendance in January and February, and then as March comes around it will trail off quite a bit. This is unfortunate, because a lot of people become target oriented agains what they don’t realize can be an unreachable target. It’s not that weight loss is an unreachable target, but basing your entire goal simply around your weight on a scale can be frustrating. Speaking from experience, I have found that the best way to reach your overall health goal of weight loss is to put away the idea that you have to lose weight every day or few days. 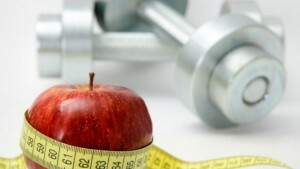 To simplify, you shouldn’t aim to lose weight, but to gain fitness. By increasing your fitness levels you will find it has a positive side effect of triggering weight loss. Personal trainers have shared their success stories from clients and what you see time and time again is that a well rounded fitness regimen, coupled with a modified diet will have the greatest effect on your overall health. And don’t let the phrase “modified diet” scare you. It’s not necessary to eat nothing but salads and drink water to reach your weight loss goal. While it’s important to reduce the intake of high-fat foods, you are better off to target a balanced plan rather than an unrealistic plan that you can’t stick to in the longer term. At one point, not too many years ago, I weighed 195 pounds. That may not seem like much, but it was well over where I should have been for optimal health. I chose to add fitness into my weekly routine and to gently modify my eathing habits over the course of the first quarter of the year and as a result I was able to drop 30 pounds in 3 months. Now I’m not saying that everyone can and will achieve that sort of result. I worked very hard to reach my fitness goal, and during that journey my weight dropped drastically and became stabilized at the level that is appropriate for my body type. An important lesson which should be learned early, is that many of the fad diet products, cleansing plans and various “burn fat faster” products are not effective. Not only that, but they are really only going to be useful in addition to an aggressive diet and exercise plan. I encourage you to seek the help of a trainer, and to find a community of people with similar goals who will help you to drive towards a realistic and reachable fitness goal. It is an amazing feeling to get there, and once you are there it is much easier to stay there. I’ll close with this brief scene from a really great documentary named Bigger, Stronger, Faster (http://www.biggerstrongerfastermovie.com/) where the film’s director and writer Chris Bell speaks with a fitness model who represents Hydroxycut. Watch for yourself and you will get an idea of just what it means to rely solely on taking a pill to get into shape.